There is a common saying in Singapore that it is better to die from a critical illness than to be plagued by hefty medical bills. There is no denying that seeking medical treatment in this tiny red dot can be a very expensive affair, more often than not causing many to experience cash flow anxiety or even landing in massive debts. However, all hope (and money) is not lost when it comes to having the right insurance plan that helps to alleviate your costs and liabilities. Most of us are covered for hospitalisation insurance such as MediShield Life, Integrated Plans or employee benefits. This provides the first step in “buying back” our health by removing partially or completely the cost of treatment in a hospital. Yet having this base alone may not be sufficient, just like having rice alone may not be able to provide the full nutritional benefits required in a good meal even if it can undoubtedly can keep our stomachs full. How Does The Early Critical Illness Plan Work? Similar to the normal Critical Illness (CI) policy, the Early Critical Illness (ECI) plan will provide a lump sum cash payout upon a successful claim. 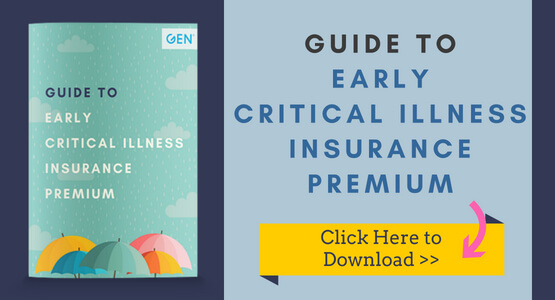 Yet, unlike a CI policy when the illness covered can only be claimed upon reaching the “severe or critical stage”, the ECI plan extends the coverage to cover the “early and intermediate” stages too. This means that a claim can be made when one needs to fit a pacemaker rather than having to suffer from and survive a major heart attack. This alone have made the use of ECI plans so much more essential and necessary in financial planning. The uniqueness of this particular type of plan is that the insured gets to receive the intended payout due to him/her after the confirmation of the diagnosis. When the claim funds are able to come in so early in an illness diagnosis, this naturally opens up a lot more options in decision making such as seeking additional medical opinions, taking no-pay leave from work or perhaps even taking a conscious decision to stop work and focus on the important goal of a complete recovery. 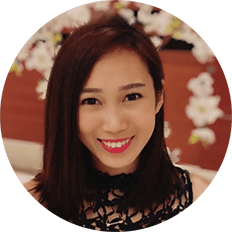 As outlined in the introduction, the pathway to complete recovery from a major illness in Singapore can come with a heavy price tag. Many people have this misconception that the cost of medical treatment only starts to weigh your wallet down when it progresses to the advanced stage. Not only is this notion false to begin with, it ignores the treatments being administered in the initial stages of the disease. Recent news has also reported medical inflation across different segments that drive up the total cost of healthcare in Singapore. Moreover, hospitalisation insurance plans comes with exclusions that limits what is claimable. For example, medical aids, transportation, non traditional medical treatments, cost of caregiving…etc are usually excluded from coverage yet are common and necessary costs incurred as part of the recovery process. This is the precise gap that ECI plans can cover to act as both a complement and supplement to existing hospitalisation insurance coverage. As a rule of thumb, the payout from a traditional CI policy is only claimable if the said illness meets the standard definition of the 37 chronic sicknesses. The Early Critical Illness plan perfectly stands in the gap where it covers other forms of diagnoses that are not covered by the traditional policy. If one is diagnosed with a critical illness and is able to claim for example an amount of $200,000 from his or her critical illness insurance policy, the timing of when the claim is made can make a big difference, even if the final amount is the same. The ability to have access to the claim money in the early stage of a critical illness can mean more resources towards earlier medical intervention and better treatment outcomes. Even an illness such as Alzheimer’s Disease where a complete cure is not likely, being able to treat and slow down the effects of the illness early can be significant to both the patient and the caregivers. Should one be diagnosed with a covered Early Critical Illness, a lump sum of money (i.e. Sum Assured) will be payable. It is not often that an Early Critical Illness payout makes one an instant millionaire. However, the money can becomes a provision for many things including those that are non-medical related that are just as important. I once made an Early Critical Illness claim for a client in 2015 who decided to set aside the money for his child’s education. It may not be directly helpful to his treatment but the peace of mind that comes with knowing that he has provided for this commitment may be just as beneficial, if not more beneficial in his path to recovery emotionally. Self-employed can be sub-divided into two categories, namely Entrepreneurs and Freelancers. Both groups encounter financial challenges unique to them. Entrepreneurs: They may be raking in the profits when they are well, but when infirmities strike, entrepreneurs are often forced to slow down substantially, and eventually step down from their businesses. It will certainly cost them the lack of revenue for long-term sustainment when this happens. Freelancers: Their streams of income are often irregular, and sometimes they may be forced to live from hand to mouth when there is not much work available. Saving and planning for their future wealth is probably not the top priority for them. It does not matter whether one is a hustling entrepreneur or a laid-back freelancer. Both are at risk for a lack of financial support. Financial anxiety is a major cause of concern among this group, and the problem is exacerbated if the self-employed are the sole breadwinners of the household. ECI plans can eliminate the risk of financial anxiety that accompanies with the potential loss of health. If one has a family history of chronic disease, it is definitely a wise decision to purchase the Early Critical Illness plan. As certain medical conditions are hereditary by nature, this plan may safeguard your liabilities and costs by making advanced provisions should you be eligible to purchase it. Baby Boomers make up a huge component of the ageing population in Singapore. Falling prey to multiple ailments is inevitable when age catches up with us. With this well thought-out plan being enforced, the liabilities that come with the risks of Comorbidity are minimised. Perhaps the most telling is to consider your given role in the family nucleus. Consider a single mother with elderly parents to support versus a young working couple with no kids in tow. People who assume the role of sole breadwinner usually benefit more from the added protection. People who are single have to plan more proactively in providing for themselves, especially when it comes to caregiving in the event that one is no longer independent. ECI plans can provide the financial means to buy caregiving services and form part of the solution towards maintaining a degree of independence and dignity. For convenience sake, one can easily add on the rider when purchasing whole life insurance policies. The inclusion of the rider means that the policyholder will have to pay slightly more for the premium, but nothing beats the fuss-free process when one submits the application form, killing two birds with one stone. The easiest solution is to directly purchase a stand-alone plan that provides a lump sum cash payout should Early Critical Illness strike. It draws a clear line among the different types of policies owned, rendering good organisation and easy tracking of benefits offered by each policy. Stand-alone plans often have their own unique selling points that may not be available in add-on rider plans. One such benefit is the provision for multiple claims. Ultimately, not everyone will see having Early Critical Illness insurance as an important addition to their insurance portfolio. Personally, the decision about having this type of coverage is not really about cost against benefits as no matter how we calculate, not having this insurance coverage will always cost less than having the coverage. Yet, having plain rice for every meal will not work for most despite the cost savings. We want our meal to be complete with the necessary proteins and fiber, with vegetables and meat and perhaps, even starters and dessert. If we think about it, it is not really about how much you can save but rather, it is really about ensuring comfort at a time of need. 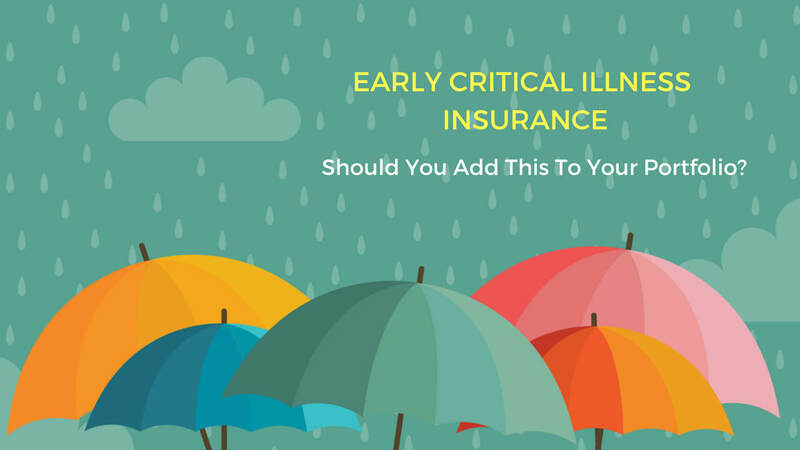 If you will like to consider the possibility of adding Early Critical Illness coverage to your portfolio, you can get started by downloading this ‘Guide to Early Critical Illness Insurance Premium’ which provides a guide to the premiums (across 4 insurers) you can expect to pay in adding ECI coverage to your portfolio. To end, I hope this article provides you with the right recipe for a financial portfolio with the full nutritional benefits that you deserve! If you want to know more about Early Critical Illness or any other enquiries, you may contact me through whatsapp, schedule an appointment with me or fill up the form below and I will get back to you as soon as possible.